I’m sure we can somehow twist this into a Guinness record. If not, then let’s get triplets next year. 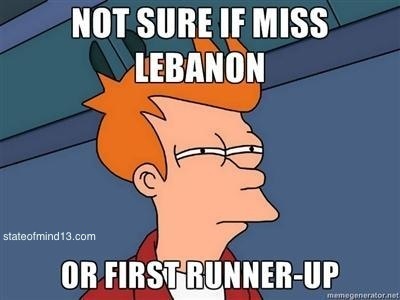 Miss Lebanon (Rina) and the 1st runner up (Romy) are twin sisters. While I haven’t watched the show in its entirety and cannot judge content (i.e. how they answered those nonsense questions), I can judge based on appearances. And let me tell you, that Rina Chibany is more than a good choice as far as looks go. I had made some assumptions about how the pageant would turn out (click here). I’m not sure how correct they are but according to what I’ve read, the pageant was not drama free. One of the girls, Marianne Bechara, withdrew halfway through the competition due to rumors that she had bought her way to the title. Apparently her father dragged her out of there. Ziad Baroud was a member of the jury. I guess that will be one of the highlights he will use in a few months to sell his MP candidacy. Maxime Chaaya climbed Mount Everest. And should therefore be present everywhere. Wael Kfoury’s songs have become overly redundant and depressing. The contestants were better than previous years. The presenter was very, very pregnant. Nothing against pregnant women but couldn’t they find someone who wasn’t ready to deliver? 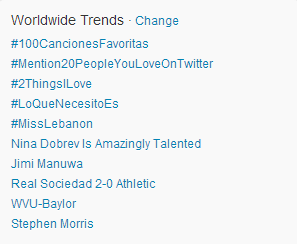 #MissLebanon trended worldwide on Twitter. But I’m actually more excited about the trend just below it. TVD in 12 days. Hell yeah – sorry Rina for having Nina Dobrev steal a second of your moment. The pageant organizers were very active on Twitter, tweeting the scores and details of the contestants. A Facebook page for the winner surfaced moments after the results, continuing with the social media trend. Nancy Ajram and Dominique Hourani Ragheb Alemeh’s wife were also part of the jury. I don’t want to sound like a conspiracy theorist seeing as many people seem to believe that the winner, Rina, deserves to win. But it feels to me as if the whole “twin” thing was a marketing ploy to get in people to talk. And we obviously are. They probably didn’t tell the jury they wanted the twins to win but by repeating over and over again (more than once in the thirty minutes or so that I saw) that those contestants were twin sister, the jury members were primed into choosing them over others. The novelty of it is just too tempting. This entry was posted in Lebanon and tagged Miss Lebanon, Rina Chibany, Romy Chibany. Bookmark the permalink.